The inspections of Granges should be completed this month. I have a little over half of the reports completed so far. The results are mixed. Very few Granges are conferring the degrees but most of those that don’t are doing the ritual program. At this time I don’t know how many new members there are but I have found that most new members are initiated in the fall. An encouraging sign is that you are working hard to remain active and most committees are doing wonderful work. When you finish with your inspection most of you tend to ease up a bit and enjoy the summer. There are picnics and vacations. But Grange work goes on. Connecticut is hosting The new England Lecturers conference this year, Aug. 6-9th at Nichols College in Dudley, MA. I’m sure our State Lecturer would like to see a large turn out from us to help her with the program. Contact her for information. It’s really a fun event and you get to meet all your friends from the other states. On Aug. 25th, the C.W.A. will have the judging of its contests at Goodwill Grange Hall in Glastonbury. “Let’s Celebrate” day is a new event since there will be no Connecticut Agricultural Fair this year. I understand there will be refreshments and some entertainment also. 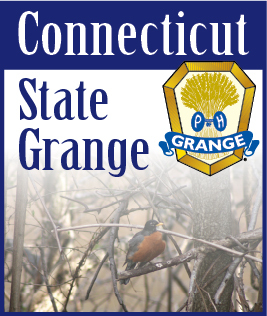 This is open to the general public, so bring your friends along and show them what the Grange is all about. Contact any member of the C.W.A. for more information. In early September the Eastern States Exposition will be upon us , The Big E. I am looking for volunteers to help out. Connecticut needs to supply ambassadors for three days of the fair and helpers for the sales table. Admission and parking are free to all who volunteer. You can work part of the day and enjoy the fair the rest of the day. I will be sending a letter to all Granges, after the next Trustees meeting at the end of June, with details for all who are interested. An important date is Sept. 1st. That is when the Community Service reports are due to Brother and Sister Cameron. I hope all Granges will Participate. There is a new format this year with prize money awarded in two areas. Large Granges and small Granges. This gives everyone a chance to win. The work of the Hosting Committee for the 2008 National Grange Convention is going well. Individual Committees have been set up with chairpersons and details are being finalized. We will gain more knowledge after this year’s National Session and will be able to be more specific about the volunteers we will need. We will have a job for all that want to be a part of this great experience. Please check the Blue Book for any dates or contests that will be in the next few months. I don’t think I have listed them all. Many may appear in this edition under specific committee reports. Sister Marge and I wish all an enjoyable and safe summer. Remember, whether you are having fun or working, think membership.